Now if that line itself doesn't get you wanting to read this latest book from Rey N. (the author behind 'A Dark Mind Without A Heart'), I don't know what will. Rey N. is an author who lives in Florida and writes psychological thrillers and detective mysteries. 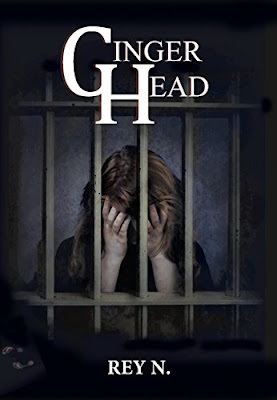 Her latest book 'Ginger Head' is out now from Crystal Publishing LLC via paperback, hard cover and is currently available on kindle via Amazon. Deep in the woods, trees left uprooted from heavy rain surround an old unmarked grave, a purple ribbon tied around the victim’s neck. A vicious killer stalks the small town of Weatherpeake. When Abigail Sullivan is assigned her first homicide case, she is determined to prove her worth to the male- dominated police force. Unfortunately, her confidence falters as a single homicide escalates to a full-blown serial murder case. She soon realizes that this small town holds deadly secrets behind every white picket fence. The only clue is a journal, but can Abby believe it? The deeper she delves into its pages, the more obvious it becomes that even those closest to her cannot be trusted. Will she manage to outsmart the murderer before she becomes the next victim? Rey N. books are targeted to young and mature adults. There is nothing like a twist or a shock to keep readers on the edge of their seats. This is what her story 'Ginger Head' offers, a page turner with numerous twist and turns, roller coaster rides and plenty of excitement. It keeps you in suspense till the very end.